I-roast 2 for 2 years now...I'm loving everything except batch size. nice... i found an sc about 2 years ago...any recommendations on the co? The old Galloping Gourmets are good (ebay) and folks are buying new ones (Sunpentown) and getting good results. Altho drob and I went MooBQ ( ) a while back I still think an SCCO is the bees knees for all but the hopelessly lost. Easy. Inexpensive. Reliable. Precise. Compact. The project end calls for a steel centerpost replacement which can be done with a few nuts/bolts, a Dremel tool and a tube of JB Weld. I really gotta look into this, it sounds really cool. 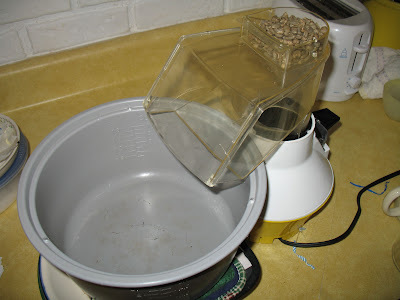 anyone have any good online resources for how to make or buy a roaster, and where can you get fresh beans? All you need is right here, my son. What's your budget? I have been roasting for a year and a half now and just love it. I started with a roaster, that will go unnamed, until I killed it in 6 months, than I roasted in a dutch oven for 2 months until I got the HotTop. This last year I have learned a great deal about beans, harvest, shipping times, and roasting. I love that this hobby is so simple to get started on with immediate results you benefit from. There is no going back for me, even if I could only get one green bean and no roaster or stove I will be firing up a wood fire and using a wok to roast just like the whole world did before the 50's. I would sure love to have a room setup for a professional sample roaster or two and proper venting for non toxic breathing but that will wait till I have college payed for the daughter and the possible next little one. However a BBQ roaster could easily fit the budget with the same benefits as a roasting room. Yes, i am a coffee roaster. I started with a FR8 about 4 years ago. And then up graded to a behmor 1600 last christmas. I am not some one that drinks a lot of coffee, but I have learned that I dont' drink swill. Just moved from a popper to a Corretto roaster LINK... Batch size in the Corretto (a.k.a. HG/BM) is MIND NUMBING in comparison to the popper. Going from 4 oz roasts to 1.5 lbs is like night and day. Heat gun, $29.99 at Harbor Freight Tools (heat gun has 12 different settings!). Microphone stand to hold heat gun ~$22.00 at Radio Shack (I'm sure it can be done for MUCH CHEAPER on line). Rewiring the bread machine so that it runs the 'dough' cycle ONLY is a must. My first batch came dangerously close to a failure after the bread machine's thermostat shut down the unit. Plus, if you run out of time on the dough cycle and your roast isn't complete, you better be happy with it! Did I say 1 - 1.5 lbs batches? but found that the small batch size was limiting and only did this occasionally. I really did like the results, it was a great way to learn, plus I can pop popcorn not stick that bag of chemicals in the micro! Got a Behmor 1600 for my wife for our anniversary last November. Been loving home roasting ever since. We roast inside the house, and the smell is more pleasing than a problem. ...oh, and did I mention I didn't drink coffee regularly until someone (she knows who she is) got me hooked on home roasted when they visited my family last year? But you conveniently leave out the part about the fire, don't you, sir? What Fire? I have never had a fire with mine. It was more of an extra heat roasting...no actual flames in there, but some toasted/charred chaff...about as close to a fire as you can get without having one. That batch was actually completely salvaged, too. We just tried to roast too much of a high chaff bean (and might have let it go about a minute too long). And I need to say that the Behmor performed as it is supposed to. No issues after the incident, and any potential for something worse was completely contained. Me neither, although I was concerned by all the reading. I follow the advice carefully regarding self cleaning every 5 roasts and do a Simple Green cleaning every 10. I couldn't be happier with my Behmor 1600 and push most of my espresso roasts into second crack. My verdict is that it's a great drum roaster. There is no roaster or roast method which doesn't have a fire risk if the roast is left too long. None. I also started out with pooper, thanks to the ever gracious Mr Moo here. That was about 5 or 6 years ago. I've since put together a SC/CO that takes care of a couple pounds of beans a week remarkably well. Took a few years, but I finally have the wife drinking my coffee.